We’ve got two new PDFs for sale today–one for Mutants & Masterminds and one for Pathfinder/Freeport! 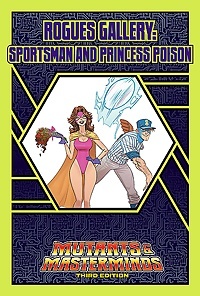 The original Sportsman and Princess Poison were villains in the 1970s who saw their villainous careers ending in the ‘80s (before it became dangerous to be a villain) and settled in Emerald City to raise their children, the new Sportsman and Ms. Scorpion. But a parent’s work is never done and with their children now “on the scene,” they might have to put on their old supersuits again. 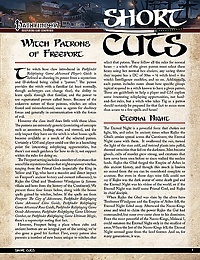 This 7-page PDF presents a new mysterious patrons to fuel witches in Freeport. Rather than vague concepts like strength or ancestry, these patrons are specific powers tied to Freeport’s campaing world, such as the King in Yellow and the elven hero of legend Thodomer Windgress, but appropriate for use in any Pathfinder Roleplaying Game-compatible campaign setting. In addition to defining the background of these patrons and the bonus spells they grant, this product talks about how other react to witches serving these patrons, and presents unique hexes available only to witches with specific patrons. Ronin Roundtable: Heroes of Freeport: Redjak Ronin Roundtable: Mutants & Masterminds Actual Play … With Bacon!